DUBH is a dramatic reinterpretation of Roisín Dubh (Dark Rosaleen), the symbolic poem marking the end of Gaelic Ireland. This newly commissioned performance by Ceara Conway will launch the evolving Murder Machine project curated by Christine Eyene in collaboration with Ormston House. DUBH is produced by Limerick-based DJ Deviant. Special thanks to performers Noirín Lynch, Eithne Walshe, Sorcha O’Shea, Anita Mahon, Clara Buteler, Courtney Sharos and Isolde Donohoe. Murder Machine has been developed in partnership with EVA international and Making Histories Visible, featuring Irish and international multidisciplinary artists Ceara Conway (Ireland), George Hallett (South Africa), Linda O’Keeffe (Ireland/UK), The Otolith Group (UK) and Rusangano Family: God Knows, MuRli and mynameisjOhn (Zimbabwe/Togo/Ireland) for an interactive display and a series of monthly public interventions around language, text and literature. 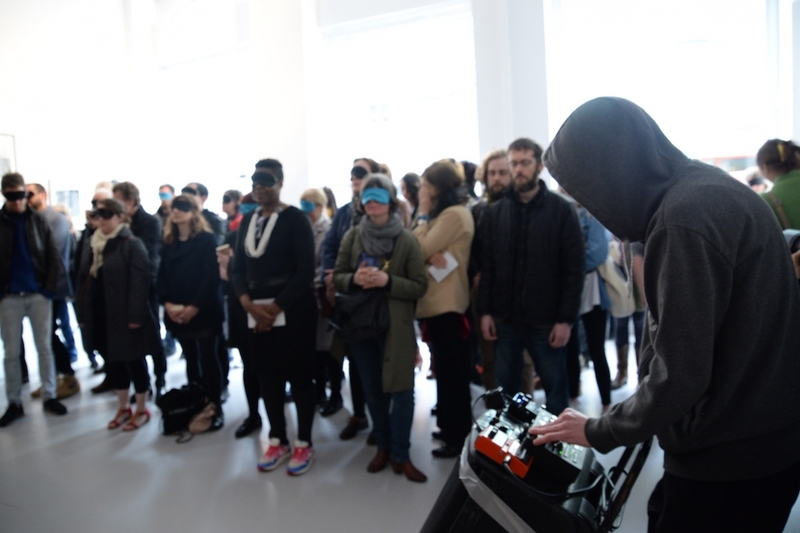 Image: blind performance of DUBH at Ormston House. Photograph by Allie Glynn at Crude Media. This event is part of the Murder Machine project.